Margaret Lane was first employed as a journalist for the Daily Express in 1928, and then as a special correspondent for the International News Service in the USA in 1931. This was followed by a further six years back home in England with the Daily Mail. In 1934, she married Bryan Wallace; they later divorced. In 1944, she married as her second husband Francis Plantagenet Hastings, 15th Earl of Huntingdon, the noted painter, and the couple had two daughters. In addition to her journalism, novels, and other writings, Margaret Lane was president at different times of the Dickens Fellowship, the Johnson Society, the Bronte Society, and the Jane Austen Society. Margaret Lane also produced a series of natural history books for children entitled The Fox, The Spider, The Stickleback, The Squirrel, The Frog and The Beaver (all 1982). She was most famous for her biography of Samuel Johnson, published in 1975. 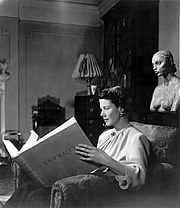 Margaret Lane is currently considered a "single author." If one or more works are by a distinct, homonymous authors, go ahead and split the author. Margaret Lane is composed of 4 names. You can examine and separate out names.